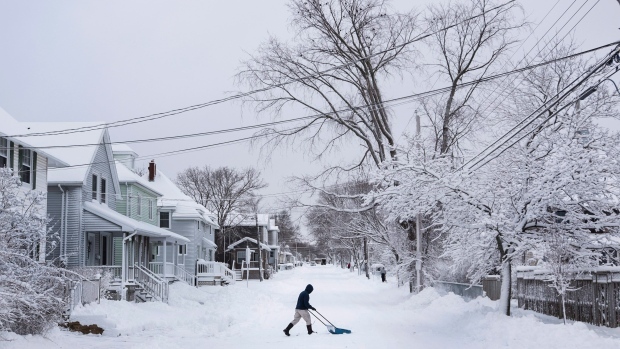 HALIFAX - Forecasters are calling for a messy day in Atlantic Canada that could see 40 centimetres of snow dumped on some areas and heavy rain in others. Snow is expected to begin falling today over mainland Nova Scotia followed by Cape Breton and Prince Edward Island, with the storm intensifying as the day wears on. Heavy snow is also expected over southeastern parts of New Brunswick as well as southwestern and central Newfoundland. Most areas are expected to get up to 20 centimetres of snow by Saturday, but Environment Canada says P.E.I. 's Kings County, parts of western Nova Scotia and Cape Breton could be slammed with double that amount. Newfoundland's Avalon Peninsula is bracing for a mixed bag of snow, ice pellets, freezing rain and heavy rain in excess of 30 millimetres with the possibility of localized flooding. Along Nova Scotia's Atlantic coast, forecasters say the storm will start with up to 20 millimetres of rain.